It is extraordinary to remind yourself that the marshes stretching eastward of Halvergate were once under water in the mouth of a great river estuary. But it is easy to imagine St Peter and St Paul as a coastal church, its great tower a beacon for shipping. In this landscape of mostly small churches, many of them Norman in character, this is a big, late medieval church. 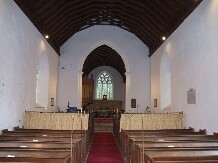 And yet, there is a homeliness to it: no aisles, no clerestory, just a long, wide nave and chancel. Halvergate is a fairly big village for this part of the world, and the parish maintains a busy life. 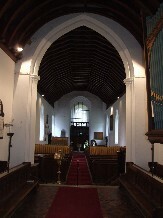 The nave is partitioned by curtains about a third of the way back to create a more intimate space; which must be a great disincentive to people to sit at the back. There was a rather idiosyncratic 19th century restoration here, including the placing on the pinnacles of the tower of four statues of unidentified figures, perhaps a century older, probably originally intended for the interior of a great house. 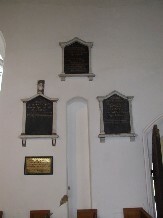 They were taken down as unsafe a few years back, and one still leans against the entrance to the south porch. 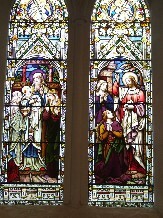 As with a number of churches around here, there is a banner stave recess set into the nave wall, and the 19th century glass is interesting, depicting the Presentation in the Temple and Christ with Mary and Martha at Bethany. 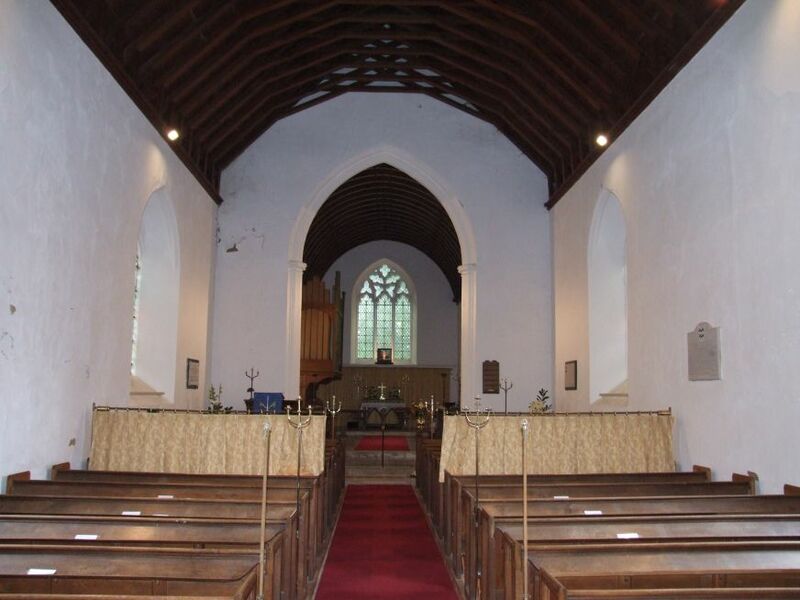 Although it was good to hear that the parish are planning to open the church to passing pilgrims and strangers after years of keeping it locked, I fear that the Restoration has left an interior with little of historic interest, except for one major survival. 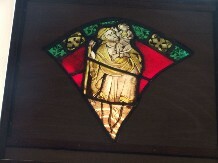 Visitors will be able to see the great treasure of the church, a 14th century image in glass of St Christopher carrying the Christ child across a river. 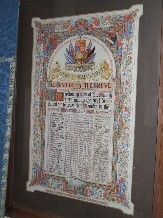 This was in the upper light of a north nave window until the 1980s, when it was taken down and restored. It was then put in a wooden frame behind glass, above the high altar, as if it was a relic. It is almost impossible to photograph. 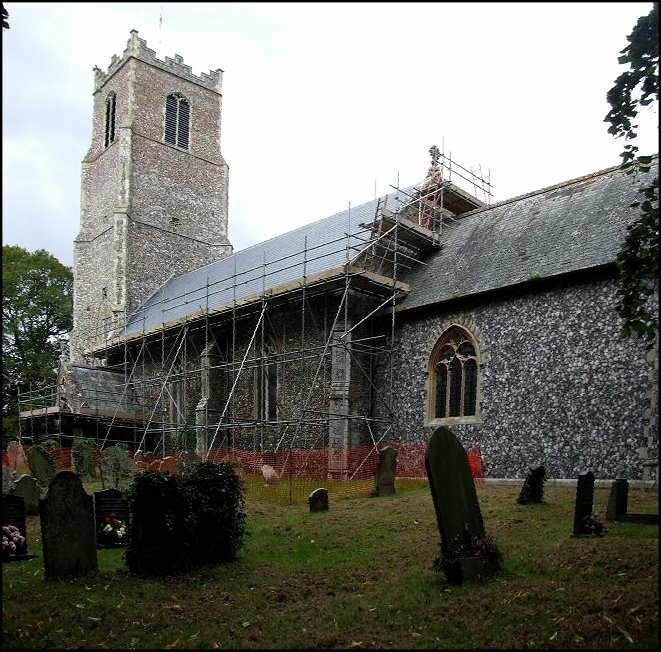 The lady on duty on Bike Ride day said that there was some concern for its safety if the church was kept open - although, of course, if it was put back in its proper place, the problem would be solved.